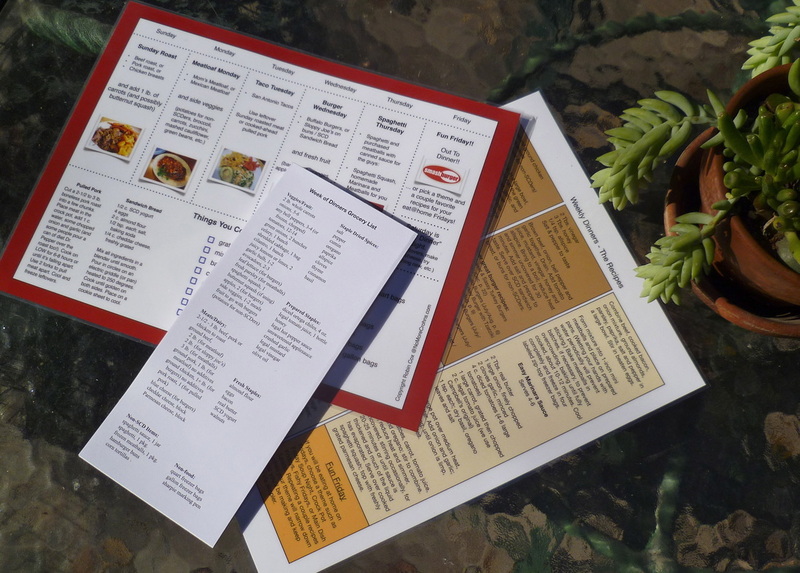 Easy Menu Packet - No More Crohn's For Me! Let's make it even easier. Do you sometimes feel overwhelmed? With Erin's three lively home schooled boys, a house to clean, meals to fix, grocery shopping, laundry, trips to the library, pediatrician visits, etc., sometimes it just sounds good to be on auto pilot with the cooking for awhile! As her diet support person, I've created a refrigerator menu guide with five+ meals she and her family really like to eat, including a few variations. I've also gathered all the necessary recipes from the website and our publications, and made a weekly grocery list, to make it all go smoothly. We realize that other people might feel the same way, so we're offering these same menu helps to make your life a little easier too. Take a break from trying new things and join Erin in relaxing a little! Your packet will come as four downloadable documents. Send them to your local print shop and ask them to laminate the one-sided refrigerator guide, laminate the two-sided recipes back to back and make pads with the 3-up grocery list page. Get inexpensive stick-on magnet strips in the craft section of Walmart to place on the back of the refrigerator guide and the pad of menus and you're ready to go! What Comes in Your Easy Menu Packet? Erin's red-trimmed, 8.5x11 dinner plan also contains a list of things you could do if you have a food prep morning. Purchase adhesive strips of magnet for posting on your fridge. Plan has a side-bar with recipes for Pulled Pork and SCD Sandwich Bread. If an item will only be used when you choose a certain recipe, it's indicated that the item is for that recipe. Use the blank areas on the list to scribble in your other shopping needs and you're good to go! Note: Use your own discretion in using ready-made products such as Ortega diced green chiles, Campbell's original tomato juice, and unsweetened applesauce which appear in a few of the recipes. Even after many years on the diet Erin can't tolerate illegals and she uses these products, but you could wait until your symptoms subside before using these, or use homemade alternatives if you are unsure.